Spring is almost here and the color pop of Tuli’s Avery bracelet will cheer up even the gloomiest of winter mornings! This bracelet features 5 strings of paper beads, first delicately hand rolled and then varnished and painted, creating one gorgeous accent piece. Handmade by women in Uganda, Tuli fair trade jewelry is primarily created from recycled paper beads. Each purchase goes directly to Uganda to fight poverty and empower the women involved with steady income and fair, livable wages. A regular income brings a long-term and lasting solution to poverty. We think that’s one meaningful bracelet! Pretty. Elegant. Shimmery. 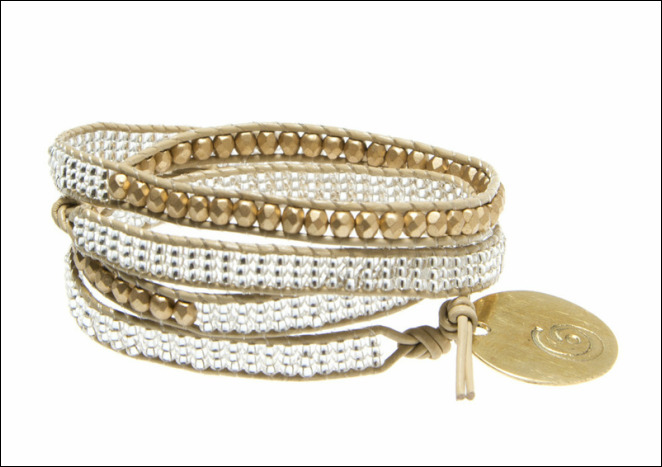 Dress your well-worn jean shorts and unblemished white t-shirt with this gorgeous triple wrap bangle. These brilliant beads stand brilliantly on their own, no need for stacking here. Your purchase supports and empowers deaf artisans in Kenya. ~ 1/4" W, adjustable length 20", 21", 32"
I am so incredibly grateful for the inspiration and energy that the companies and organizations I write about enkindle in me. Fortuned Culture, founded by Eritrean American entrepreneur, Azie Tesfai, is a recent revelation. An incomparable jewelry line with good will intentions of hope and change for the world. Each of her collections reflects the culture of its collaborating charity, while symbolizing what the charity hopes to achieve. Fortuned Culture is currently working with the Fregenet Foundation in Ethiopia, that provide early childhood education to children from lower income families. They also work with Corazon de Vida in Mexico, whose work supports orphanages in Baja. This article features her Health Bracelet, priced at $30. This splendid, delicate adornment will feed a child in an Ethiopian school, 65 meals! She wants to remind consumers that they can make a difference with every dollar they spend, "Why not buy something beautiful and help feed a group of children." Through the farsightedness of Fortuned Culture, the consumer has an observable way of connecting to a charity and the goals it seeks. The team at FC, tell each culture’s story beautifully, giving the consumer an insight into the impact that their contribution will have. I am Smitten with this collaboration of charity and art! I have written about Raven and Lily in the past, and I don't doubt that I will continue to write about them in the future. These delectable pieces were featured in In Style Magazine, April 2015... gorgeous Neha Cuffs made with traditional Indian wood-carving with a band of silver or gold leather in the center, adding a bit of shimmer to the natural wood. The aesthetic is modern and chic. Raven and Lily was brilliantly conceived by close friends Kirsten Dickerson and Sophia Lin, who both share a love of fashion and ethical design, socially conscious Raven and Lily was created as a platform to help alleviate poverty among women and is committed to offering products that are made by hand and follow fair trade standards. These cuffs are handmade by marginalized women in Northern India. This is an extraordinary piece of jewelry. Beautifully crafted, powerful...a striking, graceful, sensational silver bangle. peaceBomb is an unprecedented endeavor. This bold bracelet is made by Project peaceBomb/Article 22, an organization that aims to rebuild and clear out undetonated bombs in Laos, a landlocked nation in Southeast Asia...and the most heavily bombed country per capita in history. Over 30% of the bombs dropped on Laos during the Vietnam War did not detonate. At the current rate of removal, it will take an estimated 800 years to clear the unexploded ordnance. For each peaceBOMB product sold, Project peaceBOMB donates funds equivalent to the cost of clearing 1 to 15 square meters of land. Made with aluminum war scrap metal and shaped by human ingenuity and brilliance, these bracelets have created an opportunity for artisan families to generate income, tell their stories...and share legacies of our common history. This delectable cuff, designed by the prodigiously talented Yoko Ono, is imbued with her late husband John Lennon's stirring message "Imagine Peace." The cut out architecture applies the Japanese tradition of using negative space in a positive way. This beautiful cuff of bold communique' was made exclusively for Maiden Nation and is available in matte black steel and 14K gold-plated steel. Maiden Nation is an online marketplace committed to empowering women through ethical fashion and was founded in 2012 by artist Willa Shalit, brand developer Elizabeth Schaeffer Brown and social entrepreneur Juliana Um. The company seeks to empower women by providing a platform for them to earn an income, either by selling their products directly to consumers or by partnering with a designer for charity. The mission is “trade not aid, ” which enables the socially conscious company to curate and showcase unknown designers worldwide, thus giving these artisans exposure to a much larger audience. All products are ethically sourced, and profits are reinvested into women’s entrepreneurship projects. Yoko Ono’s “Imagine Peace” bracelet goes to the Rainbow House in Japan, an organization to help victims of the 2011 tsunami. Crazy Smitten with Maiden Nation. Crazy Smitten for Yoko Ono!